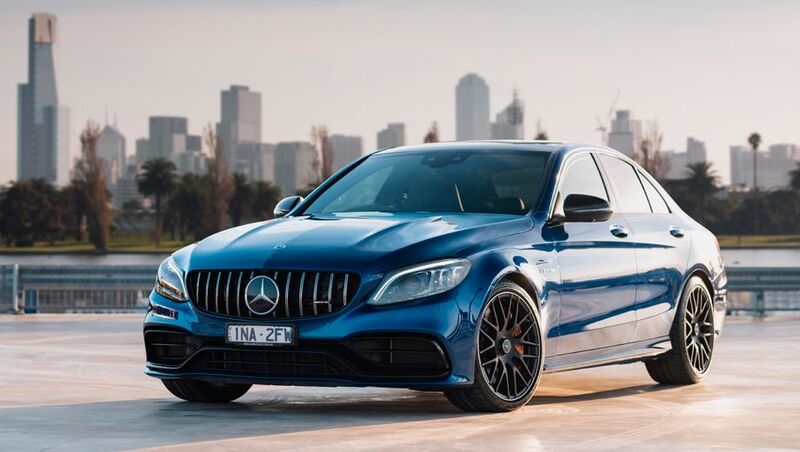 Why we’re driving it: there is a long, long waiting list in Australia for the ultimate in pocket battleships, the Mercedes-AMG C63 S.
Some people have been waiting for more than a year for the updated C63, but they will not be disappointed. Back in the day it was the BMW M3 that set the pace for fans of compact performance sedans, but that was before AMG got seriously into gear with its V8-powered C63. A big engine in a compact body always ensures excitement. The C63 just been updated for 2019, better once again, with a package of basic C-Class improvements from last year and some major tweaking of the AMG go-faster gear that makes it the top choice with driving-focussed Benz buyers in Australia. Pricing is up a touch, now starting at $160,900 for the four-door sedan and topping at $165,900 for the coupe, while the C63 is still available for stealthy drivers as a station wagon at $163,400. On the outside: this C63 stands out more than before thanks to a grille that’s been borrowed from the AMG hero cars, the latest 2-Door and 4-Door coupes. It ensures more visual impact for any arrival and moves the car further away from the lesser C-Class models. Predictable shotgun-style exhausts punctuate the rear end, there are 19-inch alloys at each corner, subtle but effective spoilers, and bolder new LED headlights. That’s all on top of the slightly edgier body styling of the latest C-car, from an update that even brought - wait for it - three squirters instead of two for the windscreen washers. Under the bonnet: the engine bay still packs a 4-litre V8 with twin turbochargers that makes the sort of power and torque that can easily overpower the rear tyres in this old-school performance car. But the unchanged engine is coupled to a new nine-speed automatic gearbox that promises smoother changes, more gears for more occasions, and improved fuel economy and refinement. The really big mechanical shift is in the suspension, where the driver-adjustable adaptive dampers have softer settings to keep the wheels nicely planted but allow more compliance and comfort in the cabin. AMG makes a big play of its driver-adjustable settings for the engine, transmission and suspension, but it now also includes a race-bred traction-control system to tweak the grip and slip through nine individual settings. There is also a Race mode and a race start function. On the inside: big clear screens dominate the cabin, same as the C200, but the difference is AMG tweaking that allows the driver – and passengers – to track everything from instant power outputs to the amount of cornering force being generated in turns. A new AMG-specific steering wheel is fitted, and finally provides a comfortable hold for people who don’t have a gorilla grip as well as new buttons to tweak the driving settings without moving your hands off the wheel. It’s all very Formula One-ish, which is apparently what AMG owners are craving. Special sports seats are part of the AMG package, with cushy Nappa leather covering, as well as colour-adjustable interior lighting, automatic air-conditioning and the other stuff - including a punchy sound system - expected in a luxury car. On the road: the C63 has always been fast and fun, but it could also be a bit punishing on bumpy roads and a handful on days when you wanted to relax and enjoy the three-pointed star. Now, thanks to the revised suspension, it’s possible to tread lightly for most of the time but go hard and fast when you feel the need. The change is most noticeable in the rear end, where the feel is much more plush in the Comfort setting and not as all-out stiff as before in the Sport settings. It’s an improvement that’s best around the city but also keeps things moving along smoothly, and with less drumming from the tyres, out in the country. If you want to crack along, and the powerhouse V8 is always ready and willing, it’s a car that is easier to handle. The new gearbox can slur through its ratios in the city then snap up and down on a twisty road, responding eagerly to paddle-shift inputs from the driver. Cabin comfort is great, even if the seats initially look too racer-shaped for long trips, and it’s fun to play with the AMG switches and dials and watch all the action on the big screens. How long it will continue to entertain, I’m not sure. Summary: every time the C63 looks to have hit its peak the engineers at the AMG hotrod shop in Germany find new ways to improve it. This time around, they’ve ensured the car is as fast and fun as expected, and still with the sound and fury that only comes with a V8, but with a softer edge that makes it more playful and enjoyable for more of the time. Comment on "Test drive: Mercedes-AMG C63 S"